A consortium of seven European companies and academic institutions has been awarded a 2 million Euro financial grant from the 7th European Framework Program. Responding to a call for proposals entitled “Space,” the team aims to develop a fully autonomous self-deployable habitat that could be used for further research in space architecture as well as a convenient housing for scientists operating in extreme environments or an emergency shelter in disaster zones. The concept of the S.H.E.E. 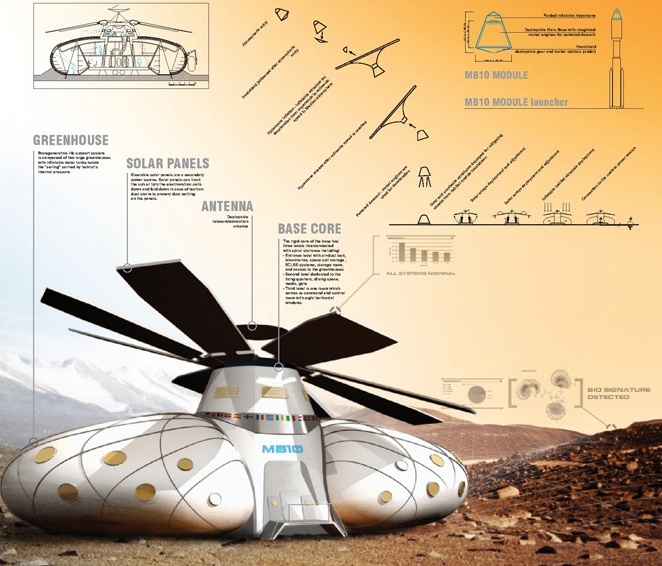 habitat is based on a research project conducted in NASA (Credits: Space Innovations). Space Safety Magazine had the opportunity to speak with the project’s spiritual father, architect Ondrej Doule, who has based the whole concept on research he conducted as a trainee at NASA Ames Research Center in 2008 under the supervision of the famous astrobiologist Chris McKay. “The task was to design a permanent habitat for 10 people to be deployed on Mars and this habitat had to fit in a payload of one single rocket,” Doule recounts. “That meant I had to use complex structures that had never been developed.” And so, the concept of Mars Base 10 (MB10) was born. The current European S.H.E.E. project started from the MB10 idea, but wanted to create a simpler and more versatile structure. “The S.H.E.E. habitat is much smaller, something like a first stage of MB10 and it should be able to serve as a planetary test bed from which we would learn how to design and build larger deployable structures like MB10,” the space architect explains. Probably the most attractive aspect of the whole venture is the possible dual applicability in space and on Earth. “It is possible that our consortium will create a specific type of architecture that will be directly applicable for example as a rescue habitat in post disaster management. This is one of the most important areas we will be addressing with regards to terrestrial applications,” says Doule. The S.H.E.E. habitat will serve as a test bed for further research on space architecture (Credits: Space Innovations). The prototype of the habitat should be manufactured in 2016. The whole project is coordinated by the International Space University in Strasbourg, France. The Austrian Liquifer System Group is in charge of the concept, technical design, and project management. Belgian Space Applications Services is responsible for the human factors and robotic systems design, while the Czech-based Sobriety will test the viability of the habitat in computer simulations. French Compagnie Maritime D. Expertises (COMEX) will develop the life support system, test the concept, and assemble the habitat. The final manufacturing will be in the hands of the University of Tartu, Estonia. The last team member is Doule’s emerging Czech company Space Innovations. How come those pictures are so small????!! Higher resolution please. If you click on the image, you can pull up a full size view. Unfortunately, at full size they don’t fit in the article! You are quite right, Lars! My apologies. My delay in getting back to you was an attempt to acquire a higher resolution image, but I have unfortunately been unsuccsessful.